Photo booths become a national craze, letting best friends and puppy lovers take home a four-strip keepsake. Shuffle games move beyond bowling with Deluxe Shuffle Targette , Auto Test lets practicing drivers learn the rules of the road, and Two-Player Basketball puts a new one-on-one spin on the old Basketball Champ formula. And for the smallest tykes, why not let Peppy the Clown or his old pal Bimbo dance your cares away? 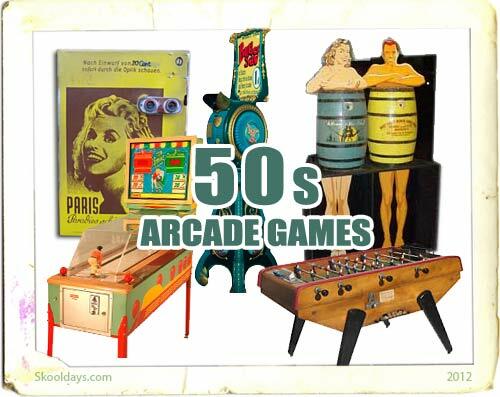 This entry was posted in Arcade and tagged 1950 by Skooldays. Bookmark the permalink. I have some games. One is a Twin Twister, the second is Golden Gate, and the Third one is pinball. I was wondering on an idea on an estimate for how much they are worth. If not could you direct me in the right direction. /Users/kevinbutler/Desktop/252179724841_1.jpg/Users/kevinbutler/Desktop/351483243774_1.jpg/Users/kevinbutler/Desktop/131662579527_1.jpg/Users/kevinbutler/Desktop/291627726415_1.jpg I’ve added these images of movie mutoscope machines that I’ve seen being sold at a memorable seller’s website..I hope that You might add them to this section dedicated to “Peep Show Barrels”?